Baby carrots are all the rage these days and most people have swapped the big, standard carrots for these convenient mini-carrots. However, it turns out that you shouldn’t believe your baby carrots after all. There is a website named World Carrot Museum, which offers detailed information regarding both carrots and baby carrots. “Baby carrots have become a lunch box staple,” it says, revealing that they first appeared in U.S. supermarkets in 1989. “Parents love them for their convenience and because they’re seen as a healthy food choice. Kids love them because they’re sweet and fun to eat. Baby carrots are bright orange, perfectly shaped, and are even peeled. A simple Google search on baby carrots reveals different information, on how they are produced and whether they are soaked in chlorine or not. 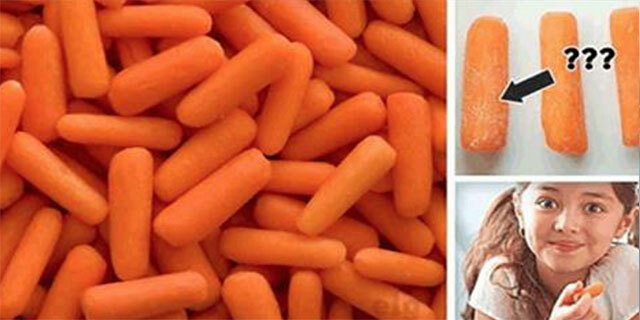 Baby carrots offered in the supermarkets are not true baby carrots. Caracas, Adelaine, and similar varieties grow to a smaller size than the typical carrot but are not real baby carrots. “In the 1980s supermarkets expected carrots to be a particular size, shape and color. Anything else had to be sold for juice or processing or animal feed or just thrown away. One farmer wondered what would happen if he peeled the skin off the gnarly carrots, cut them into pieces and sold them in bags. Another batch, peeled and cut 2 inches long, looked like little baby carrots. Bunny balls never made it. But baby carrots were a hit. SO WHAT ABOUT THE CHLORINE? The world`s largest producer of cut and baby carrots owns a webpage called “The Truth About Baby Carrots,” in which he admits that baby carrots are washed in chlorinated water solution. However, this solution is not the same as the one used to disinfect swimming pools and kill off bacteria. If this worries you, go organic. “Organic growers use a citrus based non-toxic solution called citrox, the natural alternative to synthetic biocides for the decontamination of fresh produce, food and beverages,” according to the World Carrot Museum. Additionally, there is no need to worry about the white residue neither, since it`s not a chemical but rather an indicator that the carrot is drying out. If soaked in water for a couple of minutes, its natural color will be restored easily. Baby carrots are more sensitive to drying given that their skin has been peeled off and their surface is completely exposed. A great deal of the nutritional value of a carrot is found in the peel, which means that the nutritional profile of baby carrots is slightly reduced. However, they are still solid sources of vitamins A, B, C, and E as well as minerals like magnesium, copper, and potassium. What`s more, they are low in calories, too. If crunchy and sweet, they serve as good treat for your children.